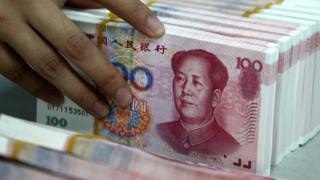 The figure is in line with Beijing's growth target of between 6.5% and 7%. But the data comes days after the leader of one Chinese province admitted GDP data was faked for several years. China is a key driver of the global economy and a growth slowdown is a major concern for investors around the world. Some analysts have taken heart from data showing growth in the last three months of 2016 was at an annual rate of 6.8% - a slightly faster pace than the rest of the year. But many observers have been saying for years that the country's growth was actually much weaker than the official data suggests. And those beliefs gained more support this week, when the governor of Liaoning, Chen Qiufa, said his province had been "involved in a large-scale financial deception" between 2011 and 2014, and that economic data had been doctored. Addressing reporters' questions about the Liaoning admission, the director of the National Bureau of Statistics said on Friday that the national data was "truthful and reliable". Ning Jizhe added that "statistics departments on various levels will also be strengthening the law enforcement, supervision, and checks on figures" and "resolutely guarding and preventing" the fabricating of data. It plays an important role as a buyer of oil and other commodities, and its slowdown has been a factor in the decline in the prices of such goods. Beijing's aim to rebalance the economy towards domestic consumption has led to major challenges for large manufacturing sectors, and there have been layoffs - especially in heavily staffed state-run sectors such as the steel industry. Plenty of economists think that GDP is a massively flawed form of measuring the health of any economy but in this country it is even worse. There is a significant proportion of China watchers who don't believe the GDP figures are real at all. For example, in 2016, the country's (year on year) GDP was exactly 6.7% for three quarters in a row. Mind you, even if at worse China's real GDP is around 4% at present, there are plenty of national governments which wouldn't mind a taste of those numbers. Read more from Stephen here. Although China's economy picked up slightly in the last three months of 2016, the rebound is not expected to continue, according to the Economist Intelligence Unit (EIU), which is predicting growth of 6.2% this year. "A slowdown in the property market and steps to address supply shortages in the commodity sector ought to drag again on demand and output," said the EIU's Tom Rafferty. He also pointed to potential damage to US-China trade ties under a Donald Trump presidency. Meanwhile Tim Condon from ING in Singapore said relations with a Trump administration were "the biggest known unknown". "Trump advisers and cabinet-nominees have identified the US-China relationship as in need of adjustment to support the president-elect's objective [of] a manufacturing renaissance." Mr Trump had often accused China of manipulating its currency - the yuan, also known as the renminbi - on his presidential campaign trail. Washington had also criticised China's yuan devaluation, saying it unfairly favoured Chinese exporters. Allowing the currency to appreciate was "the path of least resistance for the world's most important bilateral economic relationship" said Mr Condon - despite the downside for Chinese exporters. The trade of goods and services between US and China amounted to an estimated $659bn (£534bn) in 2015, with the US trade deficit with China totalling $336bn.